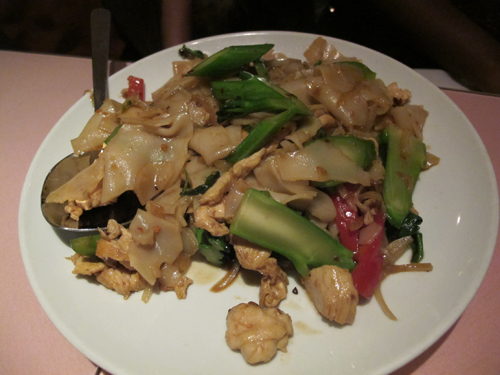 If midtown can boast one thing, I think at this point I’m gonna say it’s their Thai food. 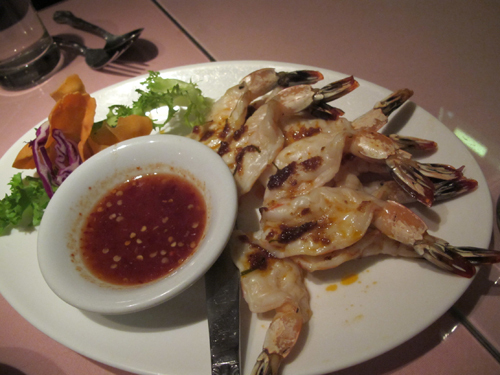 I feel like I already have a string of favorites…the hole-in-the-wall Wondee Siam on 9th Ave, and Chanpen a few blocks lower. 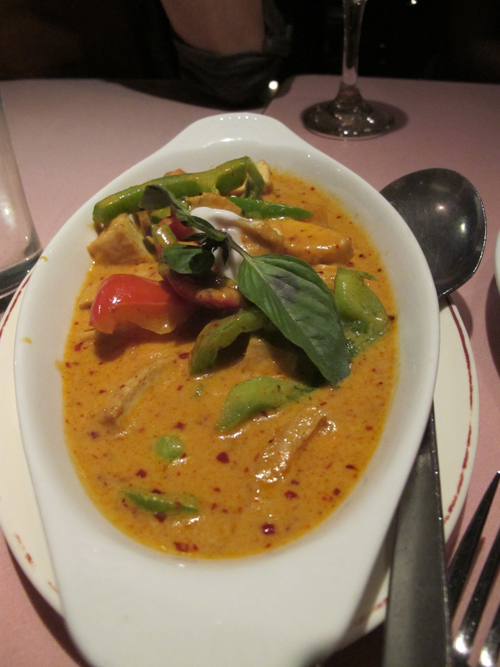 I can pretty much add Pongsri Thai to that list for their curry dishes and sauteed chicken. I am really into fried tofu these days when it comes to Thai, especially with a coconut-based curry. I asked for it spicy, and warning — they will make it really spicy. 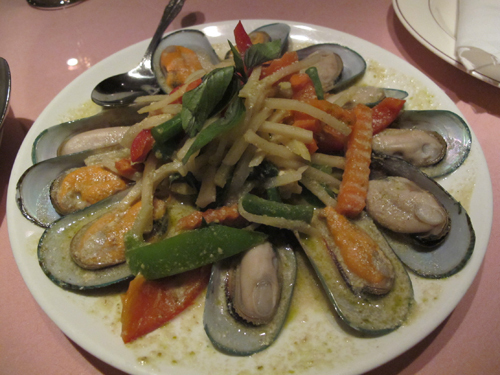 I was probably still recovering from my stuffed mussels-high from Turkey and decided to try the steamed mussels here. Wasn’t much of a fan since it was too “seafoody” for me. I guess i just prefer it with rice and lemon juice, sigh. 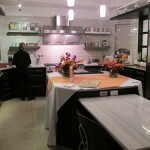 Prices aren’t bad and it’s a big space for larger parties. I’ve been here multiple times though, and even if I wasn’t big on the seafood (which is probably a personal preference if anything), I’ve never really had a bad experience with food here in general. I feel like midtown has slim pickings at times so it’s always nice to find a place that has yummy food at decent prices. I recently had the chance to visit the showroom of Fraas, a scarf company that has been in the business for over 130 years. 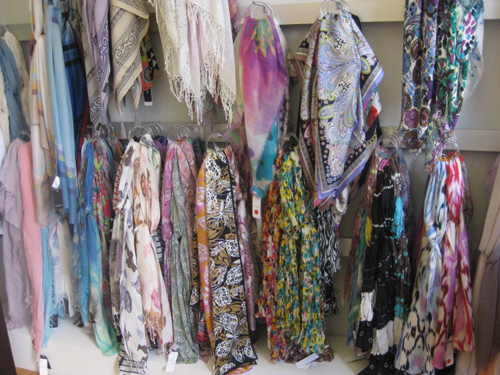 It was a scarf wonderland which was pretty great for me since scarves are my most favorite accessory ever. They just recently launched their line of super-soft “Cashmink” scarves. Cashmink — a name coined by Fraas — is actually spun from acrylic but is finer than any other natural fiber. It’s actually 20% finer than cashmere itself and it feel just as soft, if not even softer but these scarves cost MUCH less. 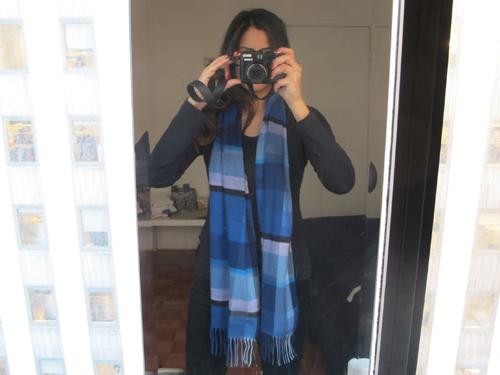 In fact, when stylist Sarah Shirley came over my apartment recently and started going through my scarf drawer, she stopped when she picked up one of the Cashmink scarves that was sent to me. “What is this? 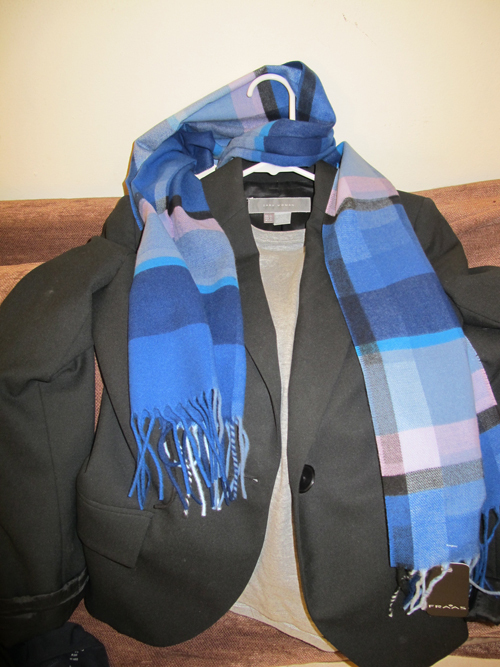 It’s so soft!” She loved the blue color combination of the scarf too and suggested I wear it with a blazer and jeans. 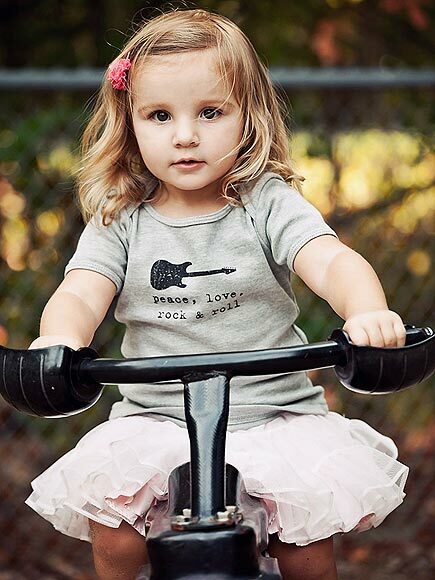 Thought it would be a great addition to our ongoing gift guide for the holidays. 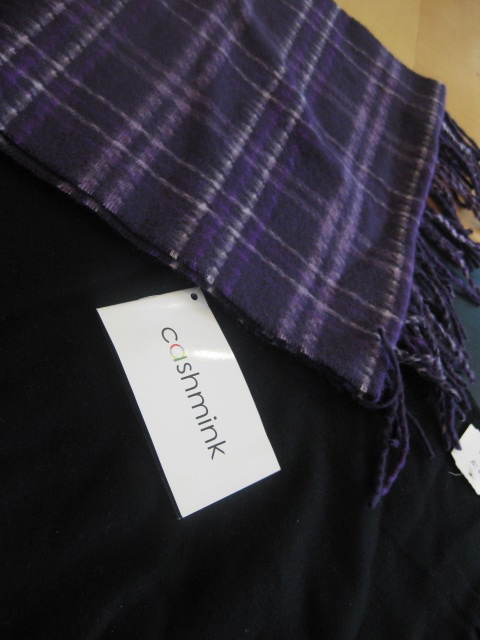 While real cashmere scarves can be $100 upwards, Cashmink ones go anywhere from $25 – $45. But P.S., I saw them on sale at JCPenney for $10. Any other scarf fiends out there? I was recently on 99.5 FM for Radio Tahrir to talk about about Beauty and the Feast, and it just aired last night! This was my very first radio interview, so it was a little nerve wrecking. The interviewer, Reem Nasr, was such a pro though, and it turned out to be a pretty fun experience :). Note: If the link doesn’t work for some reason, go to http://archive.wbai.org and you can hit “Play” from the Tuesday, Nov 23rd Radio Tahrir segment. Special thanks to Radio Tahrir for the opportunity! 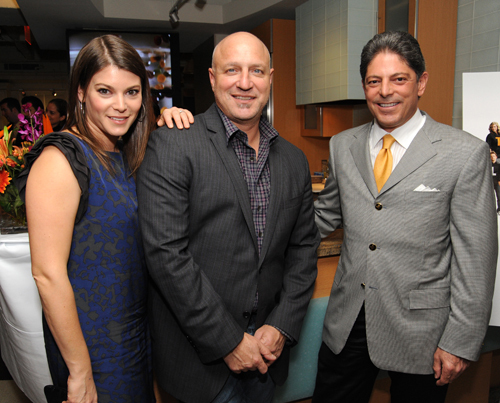 Last week, BRAVO hosted a Top Chef All-Stars Kick-Off Event in midtown. 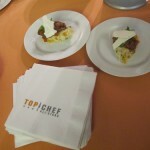 They had appetizers created by Top Chef contestants, like Duck Ragu (above), served over butternut squash grits (delish!). They also sent us home with the most delicious Godiva Bakery Dessert Truffles. Godiva just partnered with Top Chef Just Desserts for a limited-edition collection available now for $20! 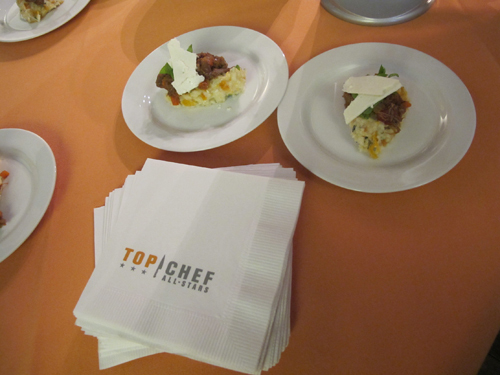 Top Chef All-Stars premieres Dec 1st on BRAVO, 10/9c. Look, I don’t do this often, but sometimes things need to be called out and this is one of those times. 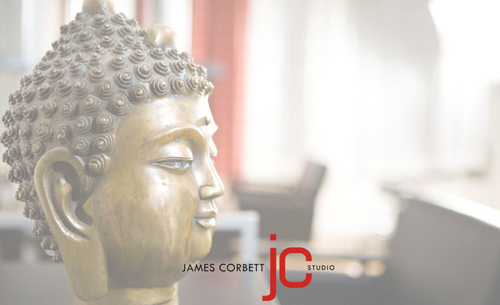 I’m normally gushing over salons I go to, but this is the first time that there’s one that I’m telling you NOT to go to: James Corbett Studio. Basically, I went to a beauty event last year and in the gift bag was a gift certificate for a complimentary organic manicure and pedicure at James Corbett. It didn’t have an expiration date so I’ve been holding on to it for a special occasion. For Thanksgiving in a couple of days, my friend is having an engagement party, so I thought it was a good time to bust out the gift certificate. I called and made an appointment. Not even an hour later, they call me back and ask me if I’m using a gift certificate for the service. I said I was, and the receptionist then tells me, “Oh, we’re not honoring those anymore.” Apparently, people have been making copies. 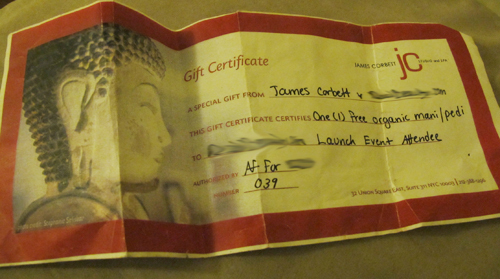 Which I totally understand, but this was a colored gift certificate with original writing (it’s not photocopied). I told them that, and then the lady says she’s handing me off to someone else (a manager I’m assuming). She then comes on the phone and I tell her, there’s no expiration date and asked if they could just honor this one since it’s authorized. She said still since it was a year ago they just won’t accept it. I tried telling her once again that this was in the gift bag, it wasn’t photocopied and if there’s a chance I could still come in and they could see it themselves, and she THEN says, “You can say what you want but we’re not accepting it, thank you,” and then abruptly HANGS UP on me! Seriously! Since she gave me the green light, here you go folks. Don’t go to James Corbett Studio in Union Square. They obviously don’t know the first thing about customer service. The end. Oh and PS, just made an appointment at Francky L’Official salon in the UES…their event was also months ago and they’re happily honoring the gift certificate I got from their launch party…just sayin.